2.4 Ghz Wireless modems for cable free Data Acquisition and GPRS/SMS Modem for communicating with remote systems/dataloggers. Also GPS Receiver to supply location data. Industrial Quad-Band 3G Modem. Includes integrated TCP/UDP IP stack so simple controllers can be connected without any special driver requirements. USB & RS232 Ports, Rugged DIN-Rail mounting enclosure. Multi-port Serial to GPRS Gateway. Now with Modbus Gateway functionality. GPRS/3G Router to enable ethernet based Data Logging (e.g. DataWeb) or Data Acquisition Devices to be connected remotely to a host server. With 4x Ethernet Ports and WIFI enabled. 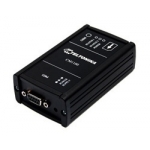 The RFU-2400 is a spread spectrum radio modem with RS-232/RS-485 interface port. It is designed for data acquisition and control applications between host and remote sensors.